Now that Todd is finally back from his vacation, things are starting to move forward again here on the old blog. Let’s begin with the newest episode of the Forgotten Filmcast! This time we’ll journey into the 60’s with American International Pictures. 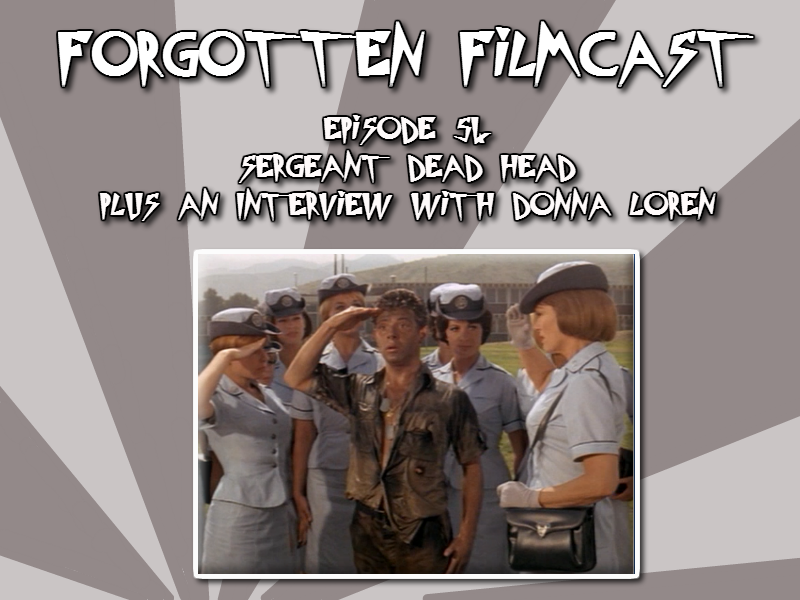 Todd is joined by Robert Lindsey from Retro Hound to discuss AIP’s 1965 film Sergeant Dead Head. This is also a very exciting episode as it features our first celebrity guest! Todd welcomes to the show one of the stars of Sergeant Dead Head, Donna Loren, for a brief interview. Donna appeared in many films and TV shows throughout the 60’s and was also known as the Dr. Pepper Girl in a series of ads for the soft drink. She talks a bit about her role in Sergeant Dead Head, as well as some of the other beach party films. And, of course, Todd makes sure to ask her about her famous appearances on two of his favorite shows…Batman and The Monkees. Don’t miss this exciting episode! Thanks! It was lots of fun and I might have caught the Podcast bug!